On our final evening in Venice my wife and I meandered from San Marco to the Rialto bridge, working up quite a seafood appetite. We stopped at nearly every restaurant; I was looking for a specific dish in a place with a view, craving Risotto alle Canocchie and the theater of Italian life. We found a small osteria south of the Rialto bridge with my favorite on the menu. A table was free in the small outdoor area where an older Italian couple were having a lively conversation while finishing what looked like seafood pizza. It was a good sign. “Una tavola fuori, per favore” I requested because I want to sit outside to watch the boats and passing crowds. Canocchie are a crayfish called mantis shrimp in English. About 1/3 the size of lobster, they pack much more flavor. I know; I grew up in New England where I learned to appreciate lobsters and shrimp. 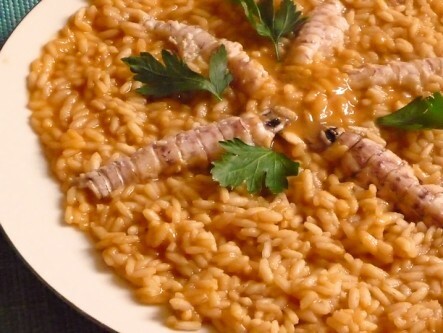 Canocchie with risotto is so savory because the stock that is added to the rice is made from the canocchie shells. The creamy risotto with the delicate and flavorful Canocchie meat is a perfect recipe. I ordered a bottle of Pinot Bianco. As the waiter poured it into my glass I noticed the flash of a camera from the crest of the Rialto. I was sitting in the background of every picturesque photo taken from atop that bridge at that hour and I felt truly blessed. “Salute.” Cheers. To be with the person I love, in one of the most beautiful cities on Earth. The waiter arrived with my plate of steaming risotto with five cannocchie laid out in a star. I traded bites with my wife who ordered the Spaghetti alle Vongole (with clams). We noticed a young lovestruck couple walking hand in hand down the narrow calle and my wife and I were reminded of ourselves the first time we came to Venice when we were in our late twenties, when we ate pizza and drank cheap wine sitting with our legs dangling over the canal, traveling on a tiny budget. We still treasure the glass bowl we bought in Murano. My wife, who speaks better Italian than I, joked with the waiter. He flattered us, saying he recognized us from before and we humored him because I was feeling the wine and enjoyed the flattery in his accent. When he brought us the bill he told us that the “serivizio e compreso,” which means the tip is included, and brought two small glasses filled with delicious bright yellow limoncello. We were nearly topped off, but we split a little cup of Frutti di Bosco gelato (wild berries flavor) from the GROM gelateria in the Campo San Barnaba near the Marino vacation rental. We headed back “home” to our apartment where we enjoyed the sound of a jazz band in the distance, that gradually got louder until it was seemingly right outside our window although actually a few buildings away on the Grand Canal. We leaned out over the canal to see the light reflecting off the waters, making ethereal waving patterns on the buildings while a five piece band on a small boat slowly cruised by with two more party boats in its wake. Ah Venezia. Grazie Italy Perfect for such a special stay in Venice!